The predominant discussion of "close-up" magic in recent years has been a lament for its decline. To be sure, aficionados seeking exhibitions of bamboozle-based spectacle not involving gambling for money might stumble across one—on rare occasions, in obscure locations (an exception being Chicago's sumptuous Palmer House Hilton, where Dennis Watkins has regaled guests with in-house magic since 2010). Until this year, that is, when artists practicing Chicago's unique contribution to an entertainment genre reaching back over millenniums seemed to spring up by—well, magic—in locations as varied as Boystown's main promenade or a landmark graveyard in Ravenswood. Some attribute this phenomenon to the launching of the Chicago Magic Lounge ("CML" to its regulars) in the Uptown/Andersonville district, others to the proliferation of playwrights incorporating sleight-of-hand stunt-work into their literary imagery, and still others, to the popularity of television variety-programs like America's Got Talent. What accounts for the swing of the pendulum toward deception as amusement? "It isn't so much an influx of magicians as it is the viability of finding venues for public performance." says Neil Tobin, whose Supernatural Chicago ran for ten years at River North's Excaliber club and who will resume his Necromancer: Near Death Experience solo show at the Rosehill Cemetery chapel in the fall, "This city has been a hotbed of magic since the days of vaudeville, when Chicago was the hub for transcontinental railroads connecting the east and west coasts. When that waned, resident magicians worked at night clubs. After those gave way to dance clubs, the magicians turned to neighborhood restaurants and taverns. Make no mistake, though—there have always been more magicians in this town than people realize." 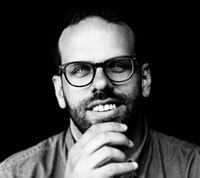 "Magicians have been trying to make inroads into the playhouses since the late 2000s," affirms David Parr, whose Magic Cabaret played weekly at Lincoln Park's Greenhouse for a decade (even sporting card tricks via FaceTime from a hospital bed in 2016, when its star prestidigitator was recovering from a leg injury) and whose Cabinet of Curiosities currently anchors the Magic Lounge's Wednesday evening show, "Now that the CML collective has its own home, other magicians have moved into its former slot at Uptown Underground, and I hear the Greenhouse has a mind-reader in residence." Mark Toland, aka the resident mind-reader at the Greenhouse referenced therein, concurs, "What CML has done is to create more visibility. It's also given magicians a place to come together that didn't really exist before." 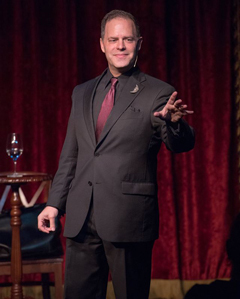 In addition to all-inclusive exhibitions, magicians are finding themselves in demand as consultants for an increasing number of business enterprises recognizing the value of uncanny illusion as a visual analogy for boardroom strategies—Toland's lectures for corporate and school groups on the concept of "lying honestly", for instance. Theater, too, has recently seen an upsurge in dramatic narrative enhanced by stylistic motifs appropriately dubbed "magic realism." Locally-produced plays mandating training in this branch of the arts include the often-revived Death and Harry Houdini, starring the aforementioned Watkins re-enacting many of the title character's famous stunts, as well as LGBT love stories (The Magic Play), real-life historical thrillers (Palace of the Occult), and musicals (Barnum, The Addams Family). Parr recalls once setting up a "magic boot camp" for the cast of a biodrama about the inventor of the "Mysto Magic set," while the currently-running midlife-crisis comedy The Days Are Shorter features actor Kendra Verhage, portraying a would-be Vegas magician, exhibiting dazzling cardplay under the tutelage of the likewise aforementioned Tobin. The wisdom of jazz musicians proclaims the formula for a long career to lie in union dues, low expenses and "a place where you can play." 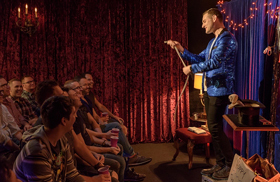 Aaron Rabkin—whose Miracles Show (co-starring "Hoppy the Psychic Wonder Bunny") occupies a storefront in Boystown identified as "Trickery Chicago"—is quick to note the trending of magic acts from long before its 2018 explosion, but acknowledges the role of the Magic Lounge in "giving the moths a flame on which to focus," adding "Once you begin to notice a certain type of act, you start to see it everywhere." Parr agrees, "The attention garnered by the CML has generated a 'halo effect' encouraging more magicians to pursue regular gigs and by doing so, raise their public profile," as does Toland, "A rising tide lifts all boats. [CML] is quickly becoming Chicago's version of Hollywood's Magic Castle—a place where the public can enjoy being entertained and performers can get stage time, yes, but also a hangout for magicians of all types." 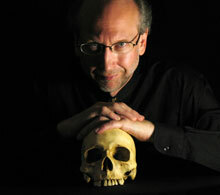 The final word, though, belongs to Joey Cranford, owner of the Chicago Magic Lounge itself. "[All of us] can all learn from each other. Our kind of magic is a very solitary art form [and so] we want to bring back a sense of community."